Vegan Brighton is famous throughout the UK and beyond. In fact, it’s part of the reason we ended up in Brighton in the first place! You’d need months to try all the places offering vegan food in Brighton (unless you like eating out 3 meals a day). House sitting there for almost three weeks gave us a good chance to thoroughly explore the best vegan restaurants in Brighton, as well as many vegan-friendly places in Brighton. If you’ve read any of our other vegan city guides, you’ll know that when going out, we opt for original food that is homemade and indulgent. Smoothies and acai bowls are great but we’re looking for the goodies that make our friend Jen May say “I’ll need to go the gym after this”. The vegan Brighton scene has an incredible amount to offer. Not only are there a bunch of all vegan restaurants in Brighton, but virtually every place advertises real vegan options. So while we usually try all the vegan places first, some non-vegan spots had some great treats we couldn’t resist. Due to the abundance of vegan food in Brighton, we decided to group based on venue type: sit down spots, pubs, cafes, and quick bites. Just keep in mind – Sundays are crazy busy days – expect full cafes and certain items running out. Purezza is an all vegan pizzeria and Italian restaurant that slings the best vegan pizza we’ve ever had – hands down, bellies up. Everything is homemade, including four kinds of cheese and an excellent sourdough crust (which they fire in a wood oven). This is THE Brighton vegan spot you can’t miss. We went to Purezza twice, that’s how good it is. The first time we had the cheesy bites, margarita pie, potato porchetta, and the pistachio creme brulee. We met up with Jen of Vegan Nomad Life who happened to be in Brighton at the same time as us so we got to try all the things and share them! The second time we had the cheese plate – amazing. Cultured cashew based cheeses, all different flavors. If we had any criticism, is that most of them were flavored – and they didn’t need it. The flavorings were top notch, like fresh chili or peppercorn, but we wanted to taste the subtlety of the cheeses more. Then we had which may be our favorite pizza ever. The spinach ricotta cherry tomato pie just had the right amount of indulgence and no cheap shortcuts – like tons of oil or friedness. Super soft and chewy dough, the spinach just slightly wilted, and the ricotta cheese was some of the best we’ve ever had. The cherry tomatoes add a fresh sweet pop. Don’t look any further for vegan pizza in Brighton! The best pizza of all time. Just look at that vegan ricotta!! This place serving vegan sushi in Brighton is another super popular place. They aim to raise awareness of overfishing that occurs at the hands of the fishing industry. They’ve got mock meats like hoisin duck but also non-mock meat options like sweet potato and cauliflower in their creative burritos! In case you hadn’t heard of it, Loving Hut is THE international vegan restaurant chain. We’d been to the one in Madrid before and weren’t too impressed, so we rarely prioritize going to Loving Huts in different cities. Plus, we’d rather patronize a local initiative with a more unique menu. One Sunday though, poor advance planning and over-packed restaurants landed us at the Loving Hut in the North Laine neighborhood. On the weekends, these little streets are closed to car traffic so people can leisurely stroll. Loving Hut has tables outside, so we enjoyed our meal listening to live music and people-watching. The meal itself was (unsurprisingly) nothing to write home about. The sampler platter was overly oily and everything was fried (which was not stated on the menu). The stir fry with vegan shrimp was fine, but nothing too exciting. Seems the best option was Jen’s. All in all not a terrible option, but not something to prioritize going to over the plethora of local and interesting vegan eats in Brighton. We included it here in case you were thinking of going – we’d give it a pass! There’s no short supply of pubs here, but the vegan pubs in Brighton definitely warrant a visit. It seems to be a trend in Brighton to have a vegan entity use the kitchen at a pub either throughout the week or only at certain times. You’ll notice on this list that there are usually two names – one is the name of the pub itself, and the other is the name of the vegan kitchen in “residency”. This is a super local fav vegan place in Brighton. Expect the outdoor seats to all to be taken. It’s definitely a big part of the LGBTQ+ scene here. During Pride weekend they had an exclusive ticketed event when we first tried to try their Sunday roast. The first time we went there was on their weekly tapas day (Tuesday). We were excited to try some food from their menu and see what tapas were interpreted as outside of Spain. While the tapas were delicious (and free with drink purchase, as they should be), we didn’t realize that the kitchen didn’t make anything else when tapas night was on. We didn’t mind, it just meant we had to come back to try more food! We finally got to grab the Sunday roast on our last weekend in Brighton, and the roast grabbed us back – full throttle. Hot damn, this was delicious. Everything tasted super fresh, down to the peas. The cook is a vegan pro. She has received doubtful inquiries into the veganness of her food- it’s that good. This plate comes loaded with roasted potatoes, carrots, parsnips, peas, cabbage, and a bean based roast wrapped in thin pastry dough. This was our favorite vegan roast in Brighton, and we wish we had been able to try it earlier so we could have eaten it again before leaving! If for nothing else, come here for the ambiance. It reminded Sam of the famous ruin bars in Budapest, decorated with random found objects, furniture, and hangings on the wall. This was solid vegan food. The best is the doner, as the hot dogs seemed to be the same flavorless ones we had back up at the Flying Duck in Glasgow. The chili topping was really good, just too spicy. The brownies were the most impressive part of the meal, but those were outsourced from an outside of town vegan bakery. Update! If you’re looking for vegan burgers in Brighton, Beezlebab has just opened (spring 2018) Beezleburger. Hot off the presses! This place just opened up in September 2018, so until we make our next visit to Brighton, we’ll have to satisfy ourselves with just perusing their menu, which looks delicious. 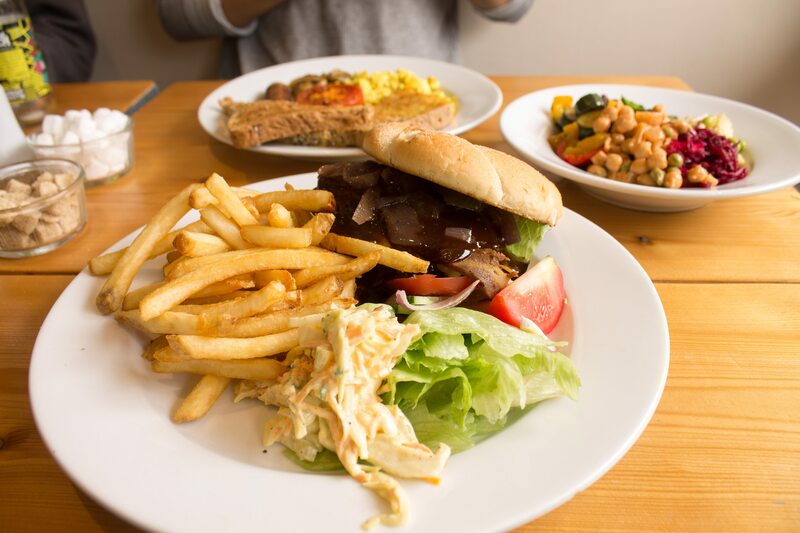 They’ve got a variety of small plates like mock duck bites and mac’n’cheese sticks, burgers (including a panko seitan burger and a tempura tofu burger), sweets, and a vegan Sunday roast dinner featuring maple glazed seitan steak. Someone please report back in the comments and tell us how yummy it all is! Another place that has recently gone all vegan! Two Wolves Kitchen is run by two vegan brothers and has a small but tasty looking menu featuring burgers, ribs, loaded fries, and other sandwiches. The normal kitchen at The Pond has lots of veggie options but we went during a special event pop up. Biff’s Jack Shack was in town from London and we couldn’t pass up the chance to try their jackfruit burgers. The bun, the patty, the sauces – everything is top notch, and perfectly sloppy like a good burger should be. *This is not a regular pop up but if you follow Biff’s Jack Shack on Facebook or Instagram they often make trips down to Brighton. This one is the only one our list that’s a vegan-friendly pub in Brighton, rather than an entirely vegan one. But they had many delicious options, warranting it an inclusion in this Brighton vegan guide! Sam sampled the fish n chips here with fellow vegan bloggers Caitlin of The Vegan Word and Christy of Blissful and Fit, who had taken a day trip down to Brighton from London just to eat. It was Brighton’s Pride Festival (the biggest in the UK), so we couldn’t manage to cross the parade in order to try the place we wanted, so we landed on this place. It is also dog-friendly, a must as Caitlin brought her insanely adorable dog, Benito with her! The tofish n chips were some of the best we found (and we tried quite a few in our summer of house sitting the UK). Unlike other versions, the nori (used for a sea flavor) was mixed into the tofu instead of as a large black strip on top like we’d found at other places. The tartar sauce was homemade and delicious and the fries were thick yet crispy. The only downside here was the portion to price ratio, always something these budget travelers have in mind. They also offer a vegan Sunday roast which gets great reviews, making it a perfect stop for vegan breakfast in Brighton. All these spots serve coffee and most serve food. These vegan cafes in Brighton are best for breakfast, brunch, and lunch. This spot has a super cool vibe, clientele, and owner. Longhouse has great coffee, food, and atmosphere. It was definitely one of our favorite vegan places in Brighton. Sam spent many an hour working here on various freelance projects ad the cafe was close to where we were house sitting. Another great thing about Longhouse is that they really make an effort to use all local products – including in all their decor. Their plates are handmade ceramic plates from a local artisan, their plants are from a local plant shop, and their coffee is from a local roaster. They also have reusable straws – yasss!! Try the pancakes and cinnamon rolls (Tuesdays and Saturdays only as they come from another bakery!). We loved this place so much that we wrote an entire article about it – read it here. Green Kitchen Cafe is a vegan cafe in Brighton a tad on the outskirts of the center but totally worth your trip. Has an extensive menu with both indulgent and healthy, lighter options. Great portions and price and it’s hard to go wrong here. We paid a couple visits, trying their burgers, breakfasts, and sandwiches. Everything is oh-so-homemade and delicious. Note that it’s a small space with just a few tables, but we never had trouble getting one. Try the full English breakfast (any day), or the Sunday roast, or the egg salad sandwich. This was easily one of our favorite vegan breakfasts in Brighton. Infinity Foods Kitchen is right next to and owned by the same people as Infinity Foods, an all vegetarian supermarket that’s also worth a visit. We enjoyed a delicious cappuccino and a yummy plate of pancakes for 5 pounds, as well as a nice respite from the bustling North Laine neighborhood. When we visited, the cafe was vegetarian with vegan options, but in 2018 turned all vegan! They offer breakfast and lunch, as well as juices, smoothies, and hot drinks. This vegan-friendly cafe is great for getting some work done. Lots of room upstairs, with lots of wall outlets. Grab a spot by the window for great people watching. They several plant milks for coffee and some of the most delicious vegan cakes in Brighton. Just look at that chocolate mousse! These vegan places in Brighton have limited seating, but offer food you could munch in transit. These are the vegan donuts in Brighton! We were excited to see an all vegan donut shop but sad to see they didn’t have any classic flavors. This seems to be a thing with vegan donut shops rather than this place in particular. The formula seems to be put ALL THE FLAVORS together and it’ll be good. Not necessarily the case. Veren is still holding out for a good old fashioned glazed donut. We tried the cinnamon sugar donut and it was good – a bit too crispy on the outside though. Very good falafel if you need a cheap (comparably) meal on the go. We knew we had to go here when we were sitting outside at the Pasty Shop (see next entry) and overheard a guy talking about how amazing the falafel was at this place – the best he’d ever had. We’d definitely put it up there with some of the best – every bite is crispy fresh. These pasties are excellent. Not only do they have a couple vegan varieties, there’s one that’s less oily and more healthsome if you prefer that! Also, after 5:30 they have a buy one get one free deal – practically a steal. They also have decadent looking vegan desserts that sell out quickly. We don’t eat out every meal – nor do we want to. So if you fall into this category, you’ll want to know what to expect from the grocery options in Brighton. Below are the most prominently established. However, there are lots of small great local groceries and ethnic food stores – sometimes they have more veg options than you’d think. Just make sure you pack a Travel Kitchen Set! This all vegetarian supermarket in Brighton is definitely worth a visit. They will have all the specialty items you rely on. Fairly priced, but if you find similar items available elsewhere, chances are they will be cheaper. They also have a fresh bakery section where they have vegan scones, pizza, focaccia, and sausage rolls! We’ve tried the latter too, and they were quite good. The cheapest supermarket in town and frequently marks down products about to expire. We managed to grab tons of fresh herbs priced down to 19 pence, and breads half off that become fresh once toasted. While their smaller, “Sainsbury local” iterations will have vegan sandwiches for the 3-pound meal deal, they are generally a bit more expensive than Morrison’s, with less generous markdowns. Chances are you’ll be situated closer to a Sainsbury’s as we saw at least four full-size supermarkets here. Sainsbury’s is also rolling out new vegan products all the time so it’s worth popping into one to see what is newly available! Iceland is the cheapest if you don’t mind drastically reduced selection, and focus on frozen foods. You’ll find the best prices for Linda McCartney brand vegetarian and vegan items here: we recommend the sausages (rosemary ones too) and pulled pork patties. Vegetarian Shoes sells vegan shoes in Brighton but is widely known throughout Europe and their quality and stylish vegan shoes. Sam was in the market for a new pair of boots (still is – anyone have recommendations? ), so we popped in to check it out. The shop itself is a bit small with not a lot of selection, so unfortunately we didn’t find anything we wanted. They sell mainly online and are available in other stores in Europe. Still, we recommend stopping in as it’s on a main street in the North Laine neighborhood, the coolest area of the city. Look no further for a place to stay! Brighton Vegetarian Bed and Breakfast offers a few rooms, complete with a vegetarian or vegan breakfast spread! Let us know what we can’t miss next time so we can keep updating with the best vegan restaurants and vegan food in Brighton! Traveling around the UK? Check out our United Kingdom Archives, including more deliciousness in our Glasgow Vegan Guide! Pin this Brighton vegan guide!